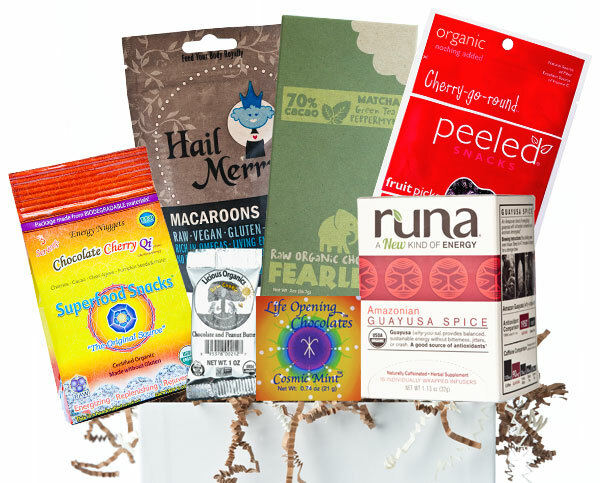 Raw is the newest arrival on the health conscious path and this gift offers treats both raw and wonderful. Nutrition packed SuperFood Snacks Chocolate Cherry Qi, delectable Hail Merry Macaroons, and a fine Fearless Raw Organic Matcha Green Tea and Peppermint Chocolate bar that rocks! Plus Peeled Snacks zingy Cherriy-go-round complimented by Runa Amazonian Guayusa Spice - a new kind of energy drink and two yummy raw treats from Boulder, Colorado - Licioius Organics Raw Chocolate and Peanut Butter cookie and Life Opening Chocolates out of this world Cosmic Mint. Truly enjoyable raw delights presented in a beautifully illustrated keepsake gift box.